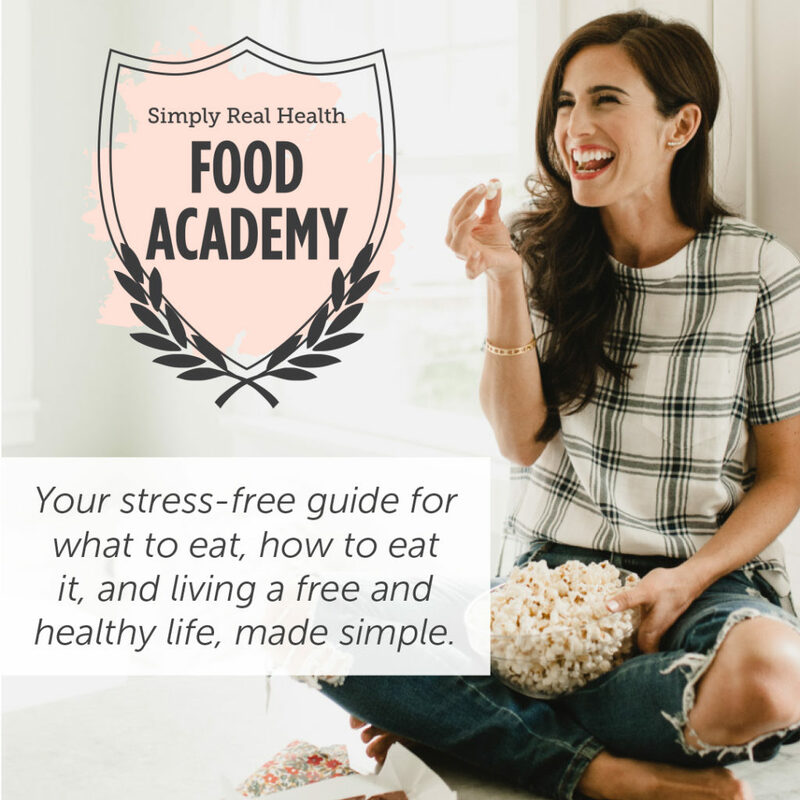 The Simply Real Health Food Academy is here! “This way of eating & living needs to be shared and learned by everyone the world over. Truly remarkable! !”- Susan G.
“As I transition to the next chapter of my life and I can’t thank you enough for providing me the tools I needed to live a better life. You’re so right, I thought I knew what healthy eating was, until I actually did this program. I feel so much more confident shopping, cooking, buying and ordering food wherever I am now that I have your killer formula and baseline to use. And I have so much enjoyment of food because of it!” – Tracy N.
The Simply Real Health Food Academy is food school, made simple. It’s a 3 week (plus a bonus intro week!) online self-guided course to food happiness: the what, where, why, and how of real food, in the real world. 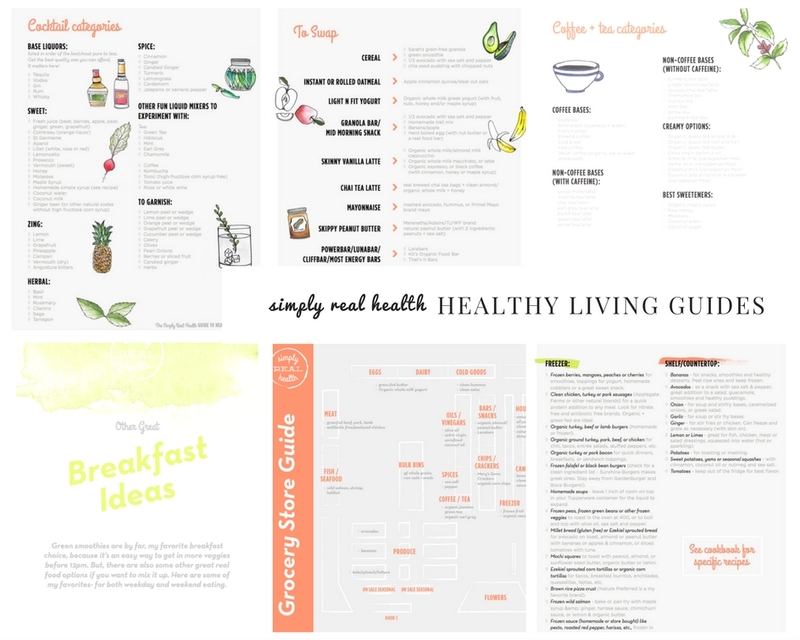 It’s your portable stress-free guide to how to eat for a healthy, beautiful and inspired life. Everything you need to know to end the confusion around food, once at for all. So you can live a healthy daily LIFESTYLE instead of a daily crazy. It’s the science, philosophy, and mentality of real food, taught in a easy digestable, real-talk, and even, dare I say—entertaining way. Kinda like we’re having coffee and girlfriend time. It’s everything I take my one-on-one clients and group program people through before we jump into the mental and emotional stuff, but all on your own time, and at your own pace. With recorded podcasts you can listen to on your own time each week, fun weekly homework assignments to keep you accountable, exclusive cooking videos on the fundamentals of easy real-food cooking, gorgeous PDF guides and handouts, brand new weekly recipes, and a lifetime membership into the Simply Real Health Community Group, lifetime access to this information, and incredible bonus goodies all along the way. To learn about real food in it’s entirety, and how much it impacts the rest of your life. To re-program your brain to want and love living a healthy life. And, to teach you everything it took me years and stress and hassle to learn and test out. What Does The Simply Real Health Academy Include? 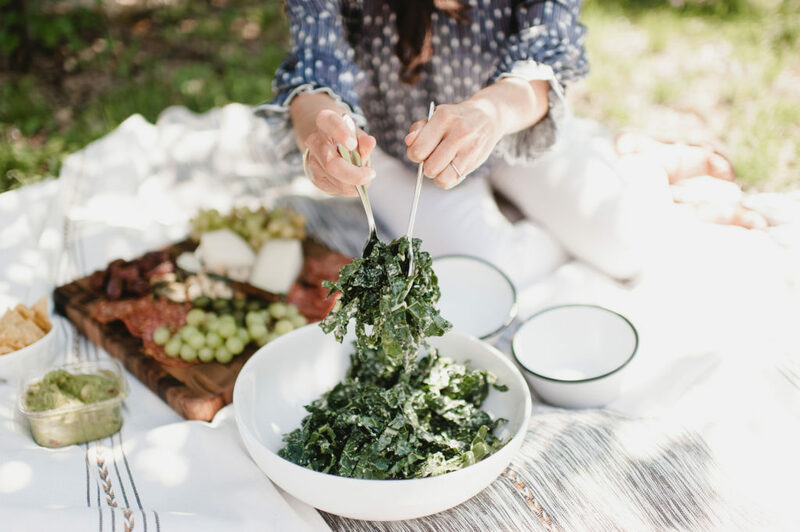 Special bonuses and private discounts for all other Simply Real Health programs as they roll out (seasonal meal plans, the big group program, etc). It’s a killer, screaming deal on purpose. if you own the cookbook or have done a meal plan and are ready for the next step in your journey. Who is this program not perfect for? if you have already done the Simply Real Life Program (because this piece is already a part of it, my love). However, if you’re wanting to join this next round, and want a head start, the Food Academy is a great pre-requisite. And, how does the process work? Login and start your Welcome Module immediately! 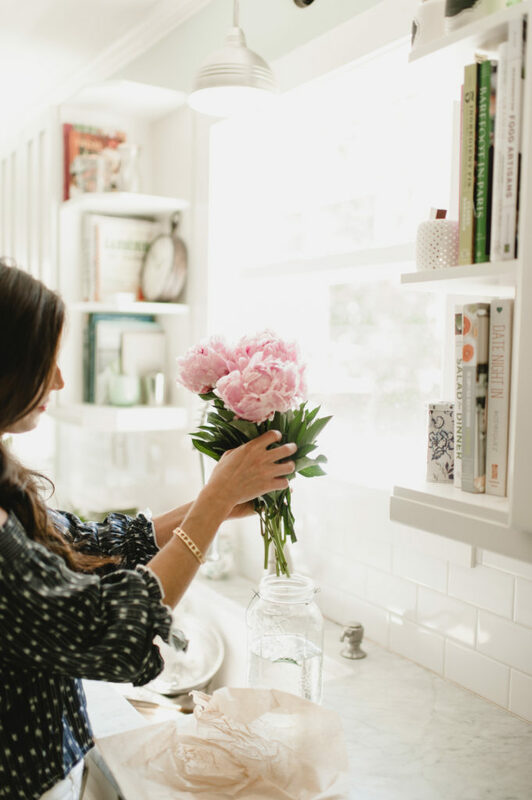 Each week will contain a podcast, fun recipes to try, gorgeous handouts and assignments to keep you accountable. Have access to the information whenever you need it! Week 1: Welcome to “Real Food 101”. 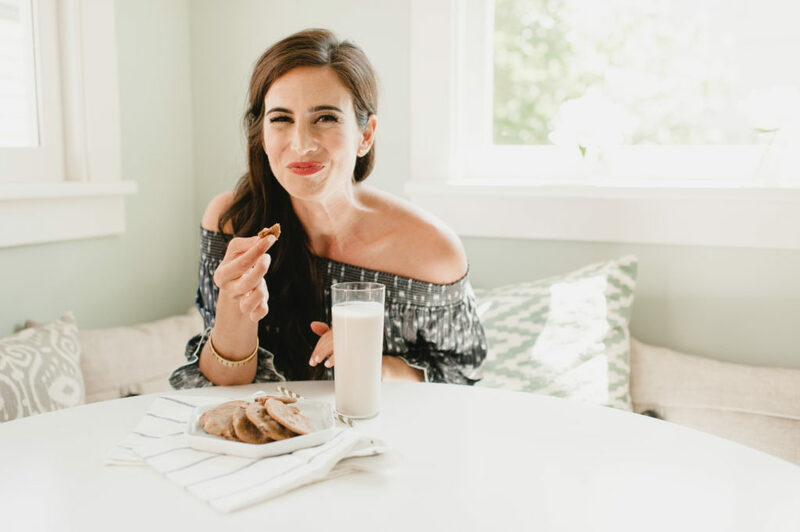 Everything you need to know, and everything you can happily ignore when it comes to food, diets, the rules, and exactly what to look for. How to start living a real food lifestyle, made simple. The big kahuna, in other words. Plus, more about your brain and the psychology behind eating. Week 2: Food specifics on dairy, grains, gluten, coffee, sugar, alcohol. What you need to know! 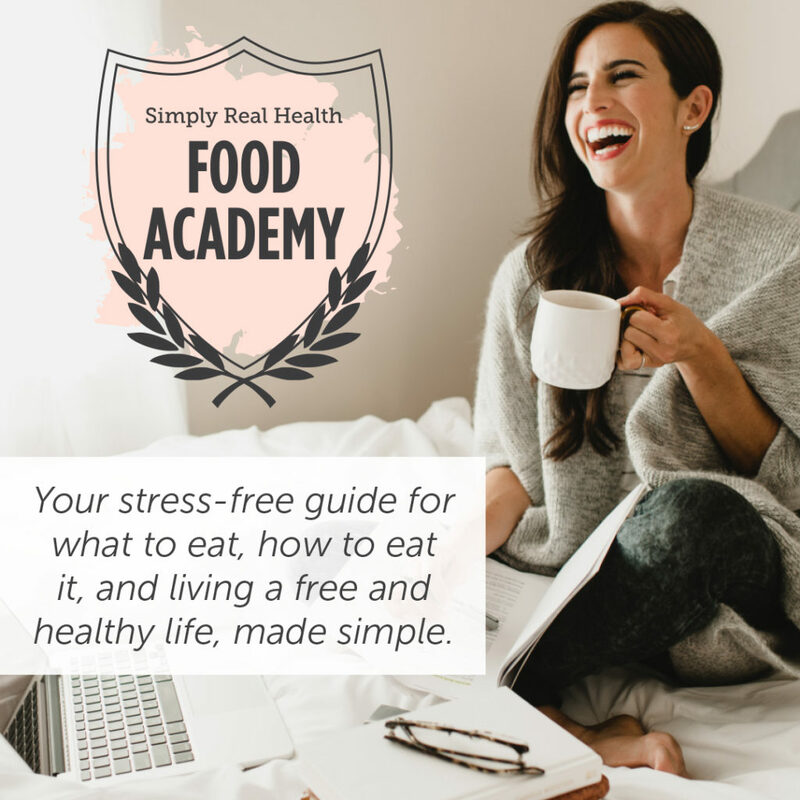 How to meal plan, grocery shop, the best way to order out, and practical daily life tips that will change the game for you, and take the stress out of the process. This is real food in the real world, a in depth-course. Week 3: A deep dive into why real food matters, and what happens inside your body when you commit to it. Identifying your clutter foods. An introduction to building a healthier relationship to food. And a challenge for you as you move forward. This knowledge has been the biggest gift in my own life– world changing, even. And now, I can’t wait to share it with you too! all of this, for just $297! Questions? We’ve got your back. Just send a note on over to hello@simplyrealhealth.com.